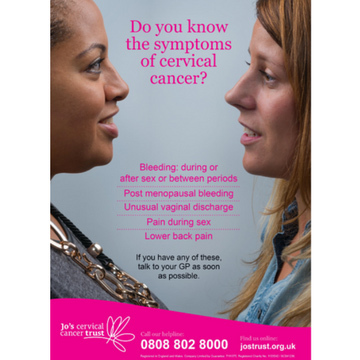 An A4 branded poster listing the five most common symptoms of cervical cancer and encouraging women to see their GP if they have any. Features women of different ethnicities. Ideal for use in GP surgeries or at awareness events. Available to download or order a printed copy. Infographic: Do you know the symptoms of cervical cancer?